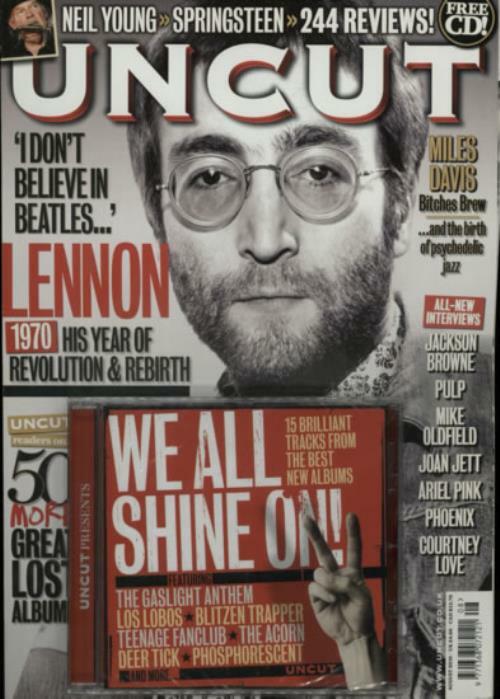 JOHN LENNON Uncut (August 2010 UK 132-page music magazine featuring a 10-page fully-illustrated article which looks at what the troubled Beatle did after the Beatles split. Confidants and band members tell all about his cold turkey, personal meltdowns and the Plastic Ono Band. With a sealed copy of the magazine's CD 'We All Shine On - 15 Brilliant Tracks From The Best New Albums', attached to the John Lennon picture cover).